The church is open for visitors during daylight hours throughout the year and we offer a wide variety of services and activities for all ages. There is a Community Café serving coffee tea and cakes and a book stall selling a wide range of books on the 2nd and 4th Thursday of each month, from 10.30 to 12.00. You are very welcome! all together in Church on 1st Sunday. Start in Church on other Sundays, and then meet in Vestry. Coffee is served after every service with bubbly and cake on special occasions. Community Café on 2nd and 4th Thursdays of the month coffee, cakes and books, in the church. For all ages. Harvest Celebrations – this year a Harvest Lunch in Church on Sunday 7 October at 12 noon. Act of Remembrance – this year on Sunday 11 November at 11 am at the War Memorial. Christmas Eve Torchlight Procession with bonfire and carols in the churchyard. Annual Arts and Crafts Weekend and Cream Teasin June. All Saints’ Singers Christmas and Spring Concerts. 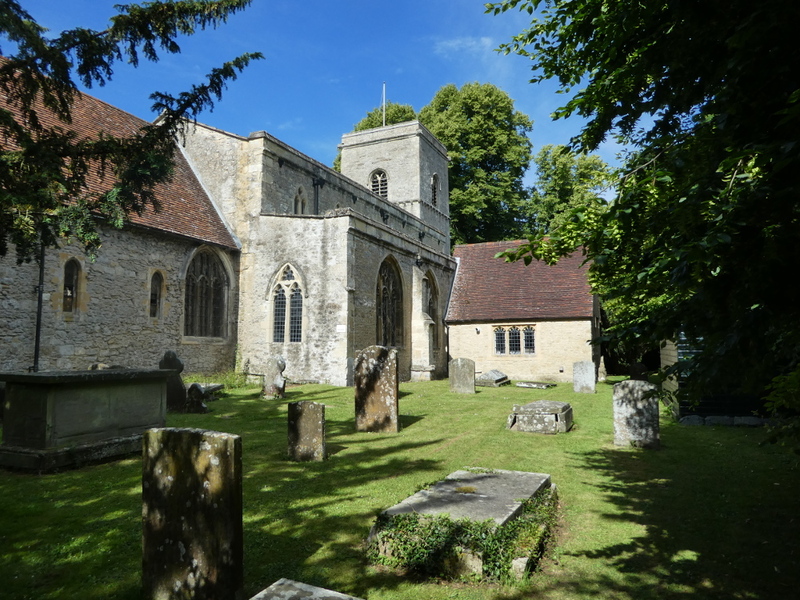 All Saints’ is Grade I listed, and was originally built in the late Norman style in the 12th century, and there are ‘crusader crosses’ by the door of the tower, said to be carved by those returning to the village from the crusades. The font is Norman. The church was later enlarged, and most of the present building is 14th century. There is an ‘Easter Sepulchre’ in the north wall of the Chancel, now containing the stone effigy of a 15th century vicar. 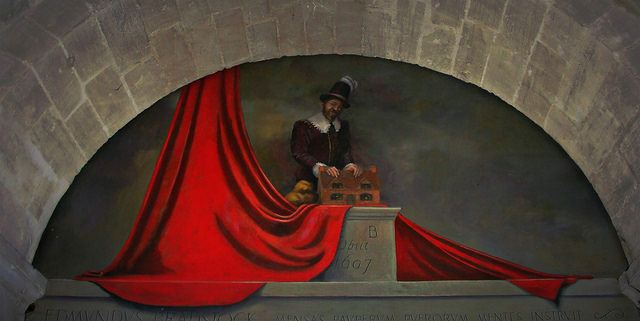 The Tudor brick porch displays the rebus of Thomas Beckington (a beacon and a tun), built as his memorial. During the Civil War the Parliamentarian Vicar stored gunpowder within the Church – which exploded one day! Following the Restoration of Charles II, the contrite parishioners put up a large wall painting of the Royal Arms above the chancel arch. Herbert Henry Asquith (Prime Minister 1908-1916) lived in the village and is buried in the churchyard. Eric Blair (George Orwell) is also buried in the churchyard, and his grave is visited each year by the Orwell Society. Planning permission has been obtained. The churchyard is a sensitive site, and the new building will be to the north side of the church, behind the 1960s vestry and virtually invisible from Church Street, and screened from the churchyard and All Saints Lane by existing yew trees. The building will have ashlar stone walls, a stainless-steel roof, and piled foundations to reduce disturbance to graves. 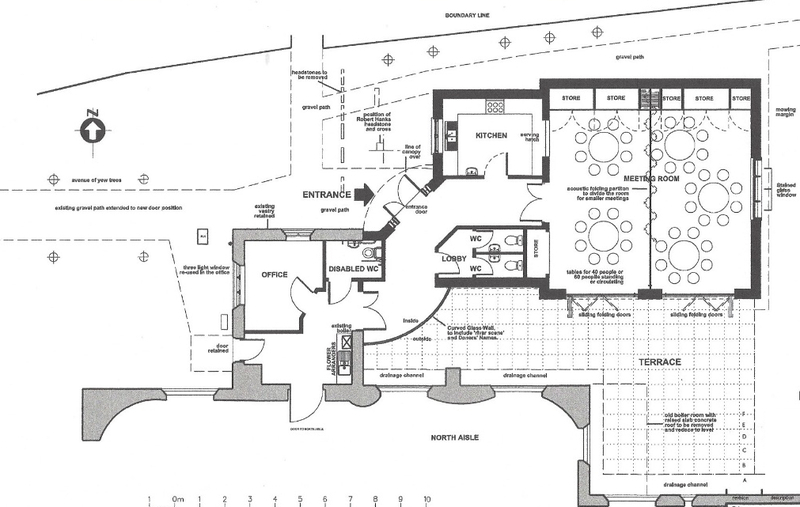 The aim is to provide the village with a new and long-lasting community space. We are appealing for £590,000 by the end of 2018. We have raised £370,000 so far, and are very grateful for every contribution, however small. Please see: My Donate for on-line donations with Gift Aid. The earliest part of the present building is mid-12th century, usually known as late Norman. The most substantial remains are visible in the lower tower where the stonework is random and distinct from the top storey, added about a hundred years later. In the lower courses the zig-zag mouldings are still visible round the windows. The carved capitals on the chancel shafts are also Late Norman. The font is similar to Norman fonts found in the Winchester region, and a few mediaeval encaustic tiles remain at its base. A further building stage extended and lightened the church. Between about 1310 and 1325 the chancel was enlarged, the present chancel arch was formed, and a wagon-shaped roof provided. A fine Decorated window was inserted in the chancel south wall, and an Easter sepulchre in its north wall. This was used for the reception of the consecrated Host on Maundy Thursday, where it remained until Easter Day. This arched recess now contains a stone effigy of a monk-like figure, believed to be Reginald Nutt, the vicar in 1495. The original nave would have been narrower, with small windows. It is interesting that the masons doing the work on the chancel and nave appears to have re-used the stones of the old chancel arch in the eastern arcade of the nave, reset into a Gothic shape. The roofs of the new aisles were lower than at present, and the original roofline can be seen on the outside stonework at the east end of the north aisle. The final phase of building occurred at the end of the 15th century, when the aisle roofs were raised to allow for the insertion of the large Perpendicular windows, the nave roof was raised and the clerestory windows inserted. The two Perpendicular windows in the chancel were also constructed at this time. 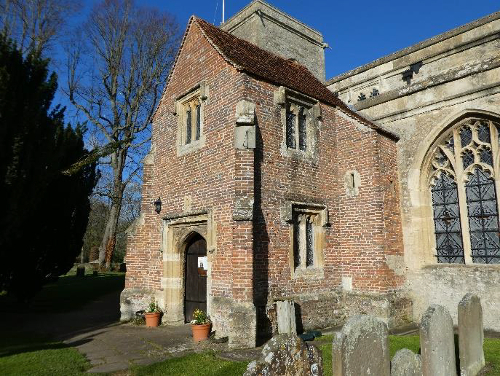 Around 1500, the brick porch on the south side of the church was built in memory of Thomas Beckington. Above the doorway is a rebus depicting a beacon and a tun (from Bekynton, or Beacontun). Above the porch is a small room, reached by a stone stairway in the south aisle. From at least 1700 to 1720 it was used as a schoolroom, judging by the carved dates and initials above the fireplace. In 1643, during the Civil War, the Vicar, one Thomas Fitch, was a Parliamentarian and bitterly opposed to King Charles I, whose royalist forces were garrisoned in Oxford. Presumably planning to take part in any local skirmish, he stored gunpowder and munitions in the church. When these unfortunately exploded, the east window was blown out and there was considerable damage to the tower. Fitch was dismissed under provisions for ‘The Ejection of Scandalous Ministers’! 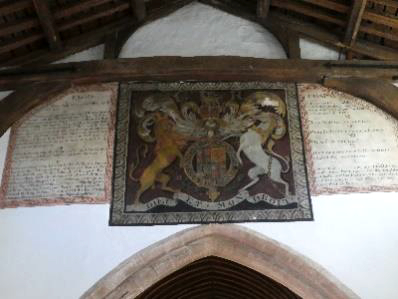 Following the Restoration of the Monarchy in 1660, a large wall painting of Charles II’s Royal Arms was executed above the chancel arch, showing loyalty to the new king – and flanked with the Ten Commandments. There are two other 17th century wall paintings. One is at the west end of the south aisle, depicting ‘six poor widows’ who were granted an allowance of bread, meat and a gown under the bequest of one William Andrews. The other, over the tower arch, commemorates Edmund Bradstock, who in his will of 1607 made provision for the poor of the parish, and for the education of children. More than four hundred year later, the trustees of Edmund Bradstock’s charity continue to award grants. There are three stalls in the chancel including misericords, which are probably early 16th century. Above them are the remains of some good mediaeval glass, arranged at random. There is also some ancient glass in the north and south aisles. The 17th century pews have been replaced, though there is a remnant of one of them behind the altar in the Lady chapel. The wineglass pulpit is 17th century, and was given to the church in 1901. The two-manual tracker organ with registration in baroque style was given to the church in 1904. Other more recent additions include the 19th century memorial glass in the north and south aisles, and the 1912 memorial glass in the east window. The vestry to the north side of the church was built in 1961.